An Australian plan, if accepted, could form a pan-ASEAN/Pacific blueprint. Draft recommendations by UNESCO have notched up a minor victory for the Australian government and efforts to thwart hard­line environmentalists who want the Great Barrier Reef listed as endangered, but any final decision still rests on a final vote to be held in Bonn later this month. At that meet the 21 ­members of the World Heritage Committee can ignore the recommendations and Australia’s 10­year, $1.5 billion plan to rehabilitate the reef, a move that would have much wider ramifications for countries with tropical waters, reef systems, and abundant marine life. Like the Great Barrier Reef there are World Heritage listed reefs in Southeast Asia and the South Pacific, which will come under much closer scrutiny by environmentalists like Greenpeace and the World Wildlife Fund, should the committee decide the Australian plan is insufficient. This includes Tubbutaha reef in the Philippines, East Rennell island in the Solomon Islands, Pitcairn Islands, the lagoons of New Caledonia, Lord Howe, Ningaloo Reef of Western Australia, Papahānaumokuākea in Hawaii, Phoenix islands of Kiribati, and the Rock Islands of Palau. Additionally, there are thousands more within the Coral Triangle, the Andaman Islands, and in the South China Sea where the Chinese have been highly destructive, tipping concrete onto reefs and building runways as part of their expanding territorial ambitions. Within ASEAN only Laos does not hold substantial biodiverse marine interests that could warrant a World Heritage listing as “a special place of cultural or physical significance” if governments like Myanmar could be bothered to apply. Meanwhile, the committee and its benchmarks for government controls and appropriate behavior in guarding delicate reef systems might face a crisis of integrity when confronted by much nastier issues impacting on marine life in developing countries than those witnessed in Australia. All reefs are facing long-term problems associated with global warming and higher acidic oceans, and this was noted in the draft recommendations made by UNESCO. But in Australia, the biggest obstacle is nitrogen runoff from fertilizers and pesticides and the dredging of shipping channels. This is impeding the recovery of the southern end of the reef, which has been badly damaged by a series of unprecedented category five cyclones in recent years. These issues are man­made and can be dealt with. Under the Australian plan, scientific advances and improved farming practices will allow for nitrogen release to be cut by 80 percent by 2025, the dredging of shipping channels is to be sharply reduced alongside the restoration of coastal management planning. 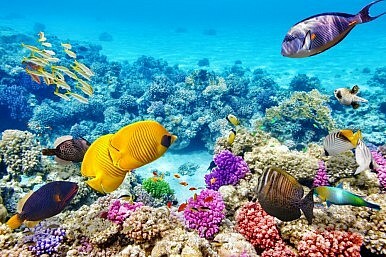 “We do look after every aspect of the use of the reef. The shipping, tourism, the port development all of the things of concern are closely managed,” Russell Reichelt, Chairman of the Great Barrier Reef Marine Park Authority, said. “We are constantly looking for ways at doing things better and we will keep doing that, regardless of the outcome,” he added. While stopping short of saying the Great Barrier Reef was endangered, the draft recommendations did warn it was in poor health and the outlook for its future was negative. UNESCO also told Australia it must take all necessary steps to ensure its future protection and if accepted by the World Heritage Committee, Canberra would be required to provide a progress report on steps taken to improve its vitality by December next year. Perhaps more importantly, if this draft does not meet the committee’s demands when it votes in Bonn and the reef is listed as endangered, then it risks setting impossible precedents and creating unrealistic expectations for the monitoring and policing of its own edicts. Dynamite and cyanide fishing, disappearing fish stocks, the quarrying of reefs for cement and the construction of roads are not uncommon in developing countries, which have been all but ignored by environmentalists pursuing an endangered listing for the Great Barrier Reef. But if the World Heritage Committee accepts the draft recommendations and the Australian plan it could form a pan-ASEAN/Pacific blueprint, using the latest science and farming techniques to vastly improve water quality, a significant boost for ASEAN and South Pacific governments struggling to stem any further degradation of their reef systems. The country is only beginning to reexamine how it preserves its ancient temples.